Box no 33 : Yay! It’s March already. The milder weather is on it’s way and it feels like Spring has Sprung ! It’s time to make bunting and prepare to eat Chocolate! We love…the floral lace too – the colour combination is just perfect. Use these flowers individually as sew on motifs or add the trim as a strip to brighten up an apron or a journal? Here at the-stitchery, we love collating inspirational selections of fabric and haberdashery which we hope you will be inspired by and enjoy. 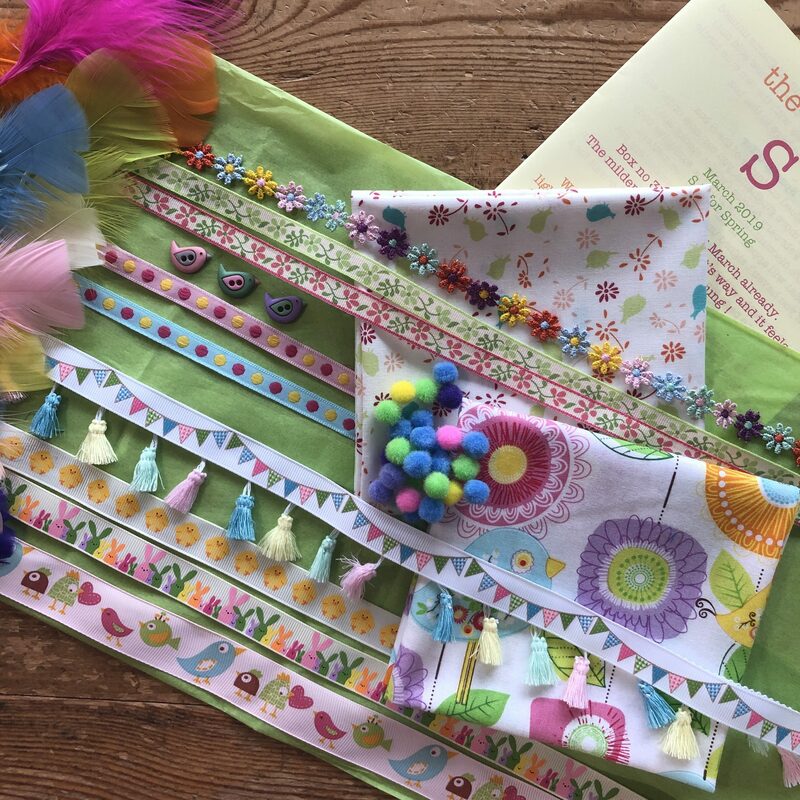 As always, the-S box is not designed to be a kit, but as ever, the-S box is jammed packed full of inspirational, innovative and useful, crafty goodies. You could treat yourself or a friend to a subscription? go to this page for subscription options and savings – why not pre-order online and guarantee your box? If you want to take out a rolling monthly subscription to the-S box without having to commit to a big stash of cash up front visit www.uopen.com/subscription-box/the-s-box and grab a guaranteed the-S box each month for £19.90. Why not treat yourself or a crafty sewist-they’ll be so pleased to receive these exciting goodies. Warning – we only ever make a limited batch of each gorgeous box ..order soon before they disappear. Spend over £25 and Delivery is Free!